Heat oven to 375°F. In 10-inch nonstick skillet, heat oil over medium-high heat until hot. Stir-fry shrimp, parsley, pepper sauce and garlic in oil 1 minute. Remove from heat. Remove dough from can; do not unroll. Cut into 24 slices; place 1 inch apart, cut side down, on ungreased cookie sheet. Press half of each dough slice to flatten. Place about 1 teaspoon shrimp mixture on flattened half of each slice. 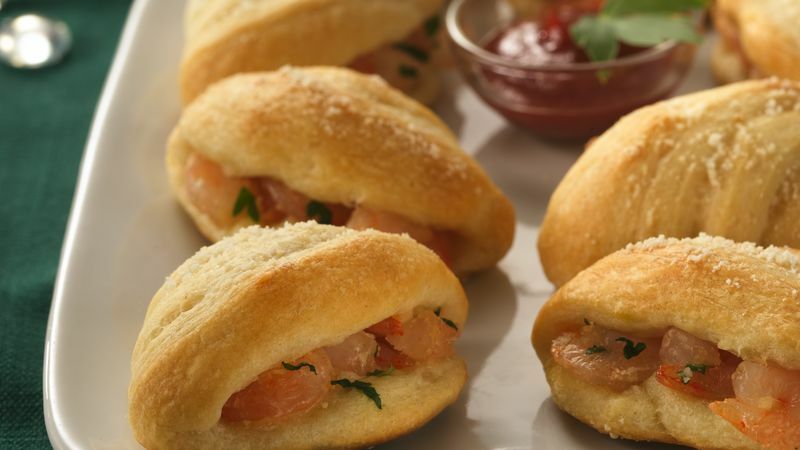 Fold remaining half of dough slice over shrimp; do not seal (openings may occur between dough layers). Sprinkle each with Parmesan cheese. Bake 11 to 13 minutes or until golden brown. Serve warm with cocktail sauce. To make ahead, prepare as directed above--except instead of baking immediately, cover and refrigerate up to 2 hours. Then uncover, and bake as directed above. Cocktail sauces have variable levels of heat, so choose a sauce according to your heat preference.